Ok, Ok. Enough jokes. Ya? For 2016, I once again recommend Avast Antivirus 2016 Free as your top antivirus software you can use on your Windows PC. Why you ask? It’s consistently performed well on its detection rates, it’s low on resources (you don’t need a brand new computer to use it! yay!) it’s user-friendly, and did I mention that you can download a free version to use for a whole year? SCORE! So, you ready for me to walk you through every step of the way to get Avast 2016 downloaded onto your computer so it can start protecting you? You all mentioned in the surveys that you wanted some videos on how to protect yourself on the internet, and here’s the first group. I’ve got a whole list of videos that make up a Complete Guide to Avast 2016 to do just that. Want to know how to install Avast antivirus software? You’ve come to the right video! I believe Avast 2016 is the best antivirus software for 2016. This top antivirus software will help prevent you from being infected. 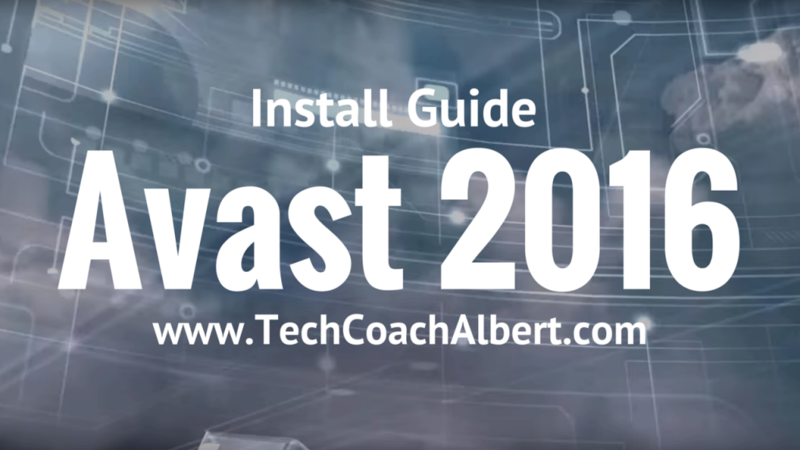 Installing Avast 2016 Free is a simple process that I’ll walk you through. In the video below, I’ll walk you through downloading and installing Avast AntiVirus 2016 Free Edition! In this next video, I’ll walk you through, step by step, how you can EASILY register your free version of Avast Antivirus 2016 software which will give you a FULL YEAR of use! Without registering, you will only get a 30 day demo. SWEET! Simple, wasn’t it? Now we’ve got an Avast license good for the whole year. Let’s continue to the next step. How to automatically protect yourself and schedule a scan your computer weekly. In this video, I’ll walk you through, step by step, how you can quickly setup your system to automatically do a recurring daily, weekly or monthly scheduled scan. Now that wasn’t so bad, was it? Nah. I knew you could do it. So you have Avast 2016 and you’re looking to do a scan on your PC before it boots into windows? Perfect! I’ve got you covered. Doing a boot scan is the deepest scan you can run. It bypasses a lot of the potential spyware/viruses from messing with the scan and producing false results or even blocking the scan altogether! This video will show you have to do an avast scan before boot up. Avast boot scan stuck? Don’t worry, it sometimes seems like it takes forever. But let it do its thing, it could take a long time based on the specs of your PC (CPU, Ram, Hard drive speed) and also the amount of files you have on there (there is TONS!). Best thing is, Avast boot scan free and included within the free version of Avast 2016! Now don’t forget, if you scheduled this, the next time you restart it will go through its routines (I forgot. LOL). Good thing is, you CAN cancel it. It’ll tell you how when it’s on your screen. So no worries. Are you tired of the annoying popups and sound notifications from Avast Antivirus? It’s one of the most annoying things about Avast in my opinion (and lots of others!). I’ll show you how to disable the sound notifications easily, and quickly. Popup notifications can’t be disabled permanently (except for turning on Silent/Gaming mode), but in the settings area you could minimize the length of time they show up. With this video, I’ll walk you through disabling the annoying sound notifications that are in Avast AntiVirus 2016 Free Edition so you can work on your computer peacefully. See, that was easy RIGHT!? Much easier than you probably thought it would be! Now, here’s the catch. EVERY Windows computer needs two things! ONE: A person operating it that pays attention. TWO: A good antivirus software in case rule #1 gets a little lacksadaisy. 🙂 SO, what you need to do is help your family and friends so they don’t mess up their computers. Share this guide with them. You can use the various buttons on the far left of the screen to easily share to Facebook (the big f! ), Twitter (little birdy! ), Email (Envelope) and Pinterest (the pretty P). Have a question, comment or a recommendation on what you’d like to see explained in a video just for you? Comment below! Thanks everyone, and have an AWESOME day! Good, , better and very best security software is available here for use.. Tech coach did well in providing us such extraordinarily designed tool. I am grateful to you.. Peace,, Will come again for more insight. Nice and descriptive article with sumptuous tone.